Medieval Monday with guest Elisabeth Hobbes & a Giveaway! We’re heading towards the end of our First Encounter theme for this round of Medieval Monday. 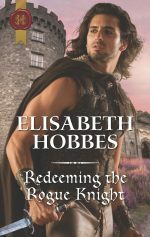 Today’s guest is Elisabeth Hobbes who has her thirteenth snippet from her novel, Redeeming the Rogue Knight. Be sure to leave Elisabeth a comment to be in the running for this theme’s giveaway that will be randomly chosen at the end of snippets. Happy reading and enjoy! Lucy jumped in surprise. She looked at him more closely. His cheeks had a touch of colour beneath the mass of beard and his eyes were brighter. Lying down and filling himself with wine seemed to have rallied his spirits and returned some of his vitality. ‘It has no name,’ Lucy answered. ‘Sister,’ Lucy answered, wondering what sort of man would kiss a woman who might be his friend’s wife. You can read my excerpt this week of FOR ALL OF EVER on Elisabeth’s blog here. Don’t forget to leave me a comment on her site to be in the running for our giveaway. Thanks for stopping by my blog today! Thanks for sharing the excerpt. Things are starting to get interesting.